Beautiful certificate from the Kahetian Railway Company issued in 1912. This historic document has an ornate border around it with a vignette of the Russina Government Seals. This item has the signatures of the Government Directors and is over 95 years old. Written in English and Russian on the front and back. Four Shillings tax stamp attached to face of bond. 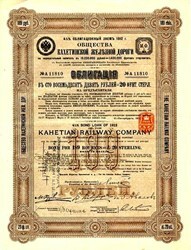 This bond was issued in 1912 to build Russia's Kahetian Railway, with an 'absolute guarantee' of repayment, and 4 � percent annual interest, by the Tsarist government. On the back, you can see the first 12 interest coupons were clipped and redeemed. The 13th, dated August, 1918, was clipped too, but attached back on to a now-worthless bond because of the Russian Revolution, when the Bolsheviks renounced the debts of the Tsar. The Kahetian Railway Company was in business to build a line from the Transcaucasian Railway to a city near Tiflis.